The TFV12 Prince Coils are to be used in the TFV12 Prince Tank. 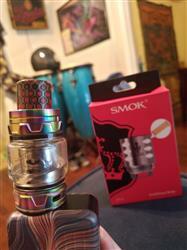 These coils are not compatible with any other tank, such as the Baby Prince Tank or the TFV12 Cloud Beast King Tank. Coils are sold individually. Order in multiples of three to get a "full pack". If coils are not ordered in multiples of three, you may not receive the box the coils come in, however each coil will be individually wrapped in the original blister pack. Been ordering from VIAB for a while. I love trying all the different coils. Always friendly and helpful. They remember my coil type even when I don't. Always a great experience! Always a great place to come into!! I have tried several of the Smok Prince coils. All have been "ok" at best, to burnt out after a couple days. I decide to give the V12 Prince Strip a try and have been using them for about a month now. They're great! They provide excellent flavor and haven't been burnt out with little use like others. Honestly I've only swapped them out to change juice that would be compatible with the previous flavor. I'm an all day caper and could probably get over a months use from just one of these coils. The VooPoo UForce Replacement Coils are compatible with the VooPoo UForce Tanks, including the new UForce T2 Tank. Sold as single coils.